Diffractive optics can simulate the effects of many conventional optics while offering powerful optical performance in a lightweight, compact component. When optical engineers talk about controlling light through diffraction, a number of terms get bandied about: binary optics, kinoforms, computer-generated holographic optical elements, and plain old diffraction gratings. The overall term that encompasses all of these concepts is diffractive optics, and for purposes of this discussion, the optical components described herein will be called diffractive optical elements (DOEs). 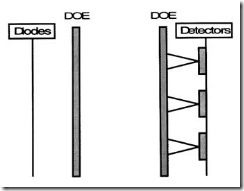 A DOE is a component that modifies wavefronts by segmenting and redirecting the segments through the use of interference and phase control. A kinoform is a DOE whose phase-controlling surfaces are smoothly varying (see figure 4.2). A binary optic is a simpler DOE that features only two phase-controlling surfaces, which introduce either a 0 or ¼ phase difference to the incident wavefront. When there are N masks, a multilevel binary optic can be generated, usually resulting in 2N phase levels. A computer-generated hologram is a DOE that is created by reducing the calculated interference pattern to a series of phase or amplitude masks. It is similar to other diffractive optics except that the useful wavefronts tend to be one of several orders generated by the pattern. A holographic optical element is a DOE generated by the interference of two wavefronts to produce a component that will be used as an optical component. The only distinction between this element and a hologram is that a hologram usually is intended to create a volumetric image of a scene. Before giving a short survey of different types of DOEs, it might be useful to emphasize some concepts that can assist in understanding how diffractive elements work. The propagation of light by many optical components can be understood most easily as bundles of rays that are transmitted through an optical system to form images or to produce light patterns. To understand DOEs, however, it is best to think in terms of wavefronts. Perpendicular to the direction of propagation of the associated light ray, a wavefront is a continuous surface on which the electric field has the same phase and, usually, the same amplitude. For example, light rays coming from a source at infinity are parallel to each other, and the corresponding wavefront is a flat electric field perpendicular to the light rays, also known as a plane wave. When this plane wave is focused by a positive lens, the plane wave is converted into converging spherical waves centered on the focal point. Diffractive optical elements can be used in conjunction with other optical components, or they can produce effects on their own, depending on what the optical engineer requires to achieve a particular design goal. One way of surveying the range of diffractive optical elements is to place them on a continuum between a classical optical element, a lens, and a DOE with no classical counterpart, a general wavefront transformer. Because DOEs can generate specific wavefronts, they can simulate the effects of classical optical components, for example, converging and diverging lenses and mirrors (figure 4.3). Fabricated on flat surfaces, DOEs also can be used to correct aberrated wavefronts. 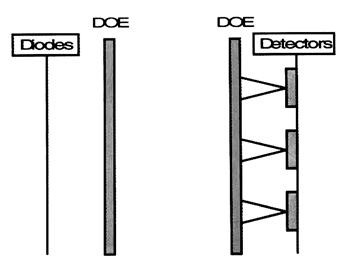 Conversely, they can act as null correctors in optical testing, providing the precise wavefront that, when transmitted through the optical system under test, should generate a simple, easily detected plane or converging wavefront so that any deviations can provide information on residual errors in the tested optics. DOEs also can act as beam samplers, devices that divert a small fraction of a wavefront from the direction of propagation for testing and control while permitting most of the beam to be transmitted without modification (figure 4.4). where lambda is the wavelength of light, the qm is the angle of the diffracted order m, and d is the repeat distance of the grating. In contrast to conventional gratings, the microlithographic technology used to generate these DOEs can yield structures that control the relative intensities of the individual beams. This is done by shaping the profile within each repeat. One particularly useful application of pattern generators is the optical interconnect. By engineering the diffraction efficiency of a diffractive optical element in its various orders, light from a number of sources, such as diode lasers, can be directed to a number of detectors (figure 4.5). These interconnects can be used both for switching applications and as the basis for arithmetic elements in an optical computer. As fabrication technologies advance, additional applications of diffractive optics emerge. If we construct a grating with smaller and smaller grating constants, the beam fanout angles increase. Eventually we reach a point at which d is smaller than the wavelength of the illuminating radiation. At that point, according to Eq. 1, there are no diffracted orders, only the zeroth order. It would seem that such a device would be useless, but these subwavelength structures can be used tosimulate the effects of antireflective surfaces and birefringent elements. Consider, for example, the triangular structure shown in figure 6, which is fabricated on the substrate of some optical element. If the refractive index and shape of the triangular structures are made properly, the serrated surface will transmit light of a particular wavelength with no reflections. It acts much like conventional antireflection films, but it has a number of advantages over standard multilayer coatings. There are no thermal expansion mismatches or surface adhesion problems. It has a large field of view and bandwidth, and it is lightweight and compact compared with other filters. Finally, it is fabricated from isotropic materials and can accommodate substantial refractive index mismatches. Because its profile is similar to that found in the eyes of moths, it often is called a moth’s eye structure. Other subwavelength structures can be designed to function as filters and polarizers.